While the crowd was pressing in on Jesus and listening to the word of God, he was standing by the Lake of Gennesaret. And he saw two boats by the lake; but the fishermen had gone out of them and were washing their nets. Getting into one of the boats, which was Simon’s, he asked him to put out a little from the land. And he sat down and taught the people from the boat. they beckoned to their partners in the other boat to come and help them. 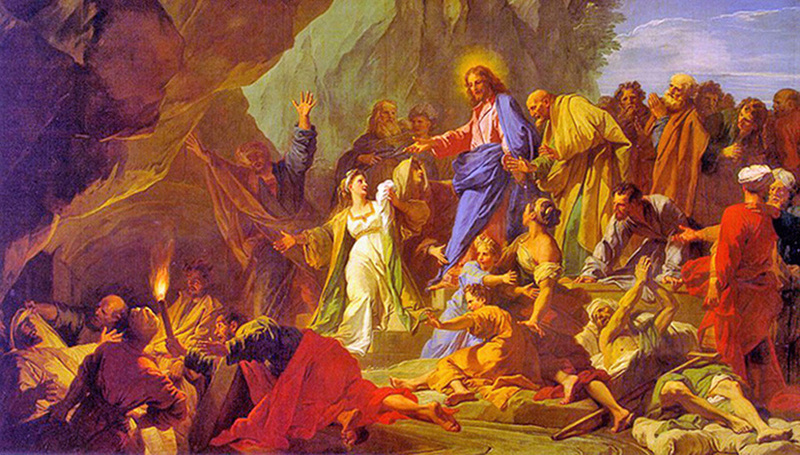 Jesus of Nazareth performed many miracles, demonstrating his power over nature and spirits, and thus confirming that the Kingdom of God is at hand (Mark 1:15). “Come, follow me, and I will make you fishers of men” (Matthew 4:19). 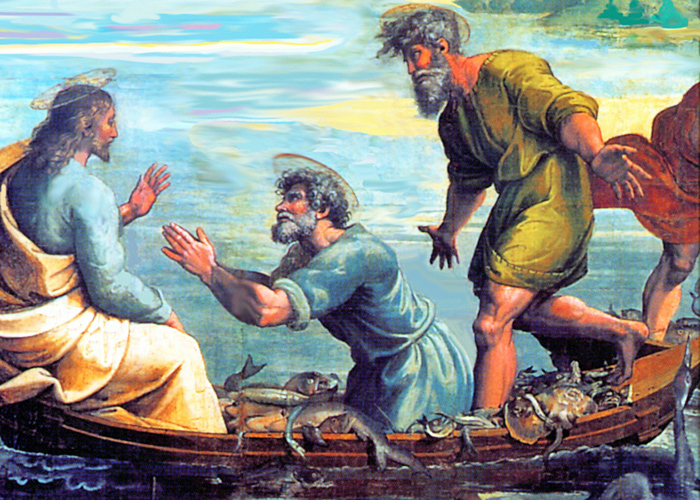 Through the above miracle, Jesus recruited his first four Apostles - Peter, his brother Andrew, and James and John. In a physical miracle, such as making the blind see, or walking on water, or calming a storm, the laws of the universe are suspended through divine intervention. In a moral miracle, such as forgiveness of sins or driving out demons, the blessing of Jesus purifies the soul. In Mark 2:1-12, Jesus performed a physical miracle, healing the paralytic, to demonstrate a moral miracle, the forgiveness of sins. Only three miracles appear in all four Gospels - his own Resurrection (Matthew 28, Mark 16, Luke 24, and John 20), the greatest miracle of them all; the feeding of the 5000 through the multiplication of the loaves and fish, found in Matthew 14:13-21, Mark 6:30-44, Luke 9:10-17, and John 6:1-14; and, while different individuals are involved (see chart), Jesus heals the blind (Matthew 9:27-31, Mark 8:22-26, Luke 18:35-43, and John 9). The miracle stories are an integral part of the Gospel narrative, as in the Gospel of Mark, where nearly half of Mark's account of the public ministry of Jesus (Chapters 1-10) describes miracles. The ministry of Jesus is centered on the establishment of God's imminent Kingdom, which ended the dominion of the evil one over the world, present ever since sin and death entered mankind. The miracles were Jesus' chief weapon in the struggle with evil (Mark 3:22-27), the most direct being the exorcism of demons, which defeated the power of evil and liberated humanity. That is why a miracle is an act of power in the Synoptic Gospels, the Greek word being δύναμις, the origin of our English words dynamic and dynamite. John in his Gospel utilizes the word σημεῖον (sign). The word τέρας (wonder) is mainly found in the Acts of the Apostles. The Gospels record twelve miracles in Capernaum, more than anywhere else in the Holy Land. What is striking is that Jesus performs those miracles that, referring to Isaiah 35:3-6 and 40, were prophecies of a Savior. John the Baptist sent his disciples to ask Jesus or Yeshua - "Are you the one who is to come, or should we expect another?" Jesus reassures John and his disciples by naming the miracles of a Savior: "the blind receive their sight, the lame walk, the lepers are cleansed, the deaf hear, the dead are raised, and the poor have good news preached to them" (Matthew 11:3-5). Jesus not only heals the leper but also instructs the leper to show himself to the priest in observance of Leviticus 13-14 (Matthew 8:1-4). Jesus Christ raised three from the dead: the daughter of Jairus the synagogue official (Mark 5:22-24, 35-43), the son of the widow of Nain (Luke 7:11-17), and Lazarus on the fourth day (John 11). The symbolic element of the miracle becomes primary in the Gospel of John. For example, in John 9, the interest in giving sight to the man born blind is not just the gift of sight, but in his coming to the spiritual insight of faith, an insight made possible by Jesus, the Light of the world. The Gospel of John enumerates seven signs of Jesus: he turns water into wine at the wedding feast of Cana (2:1-12); the healing of an official's son in Capernaum (4:43-54); the healing of a paralytic on the sabbath by the pool at Bethesda in Jerusalem (5:1-47); the feeding of the five thousand (6:1-14) before the Bread of Life discourse; walking on water (6:16-21); the healing of a man born blind (9:1-41); and the raising of Lazarus (11:1-57). John also records three appearances of Christ to his disciples following his Resurrection. The miracles of the Multiplication of the Loaves and Fish and the Wedding Feast of Cana serve as a prelude to the miracle of the Institution of the Eucharist at the Last Supper of our Lord, and the giving of Communion in our Churches throughout the world! The third millennium is more receptive to miracles as compared to the skepticism of the post-Enlightenment. Case records of inexplicable cures from cancer, the healings of Guadalupe, Mexico, Lourdes, France, and Fatima, Portugal, and reports of near-death experiences have produced an openness to the miraculous.